Spiders are air breathing arthropods and are the largest order of arachnids. Spiders are found worldwide on every continent except for Antartica. At this time of year when the weather begins to cool more spiders are seen within houses than outside. Below PESTUK offer suggestions of how to prevent spiders from entering your home. In Autumn and early Winter we receive many calls for spiders in homes. As the weather begins to cool down spiders will enter into buildings looking for shelter from the cold and wet weather. Spiders lay eggs which hatch into miniature spiders and then grow, after shedding their skins several times, into the adults. The female spider in all species is larger and heavier than the male. All spiders are capable of injecting poison from their fangs into their prey. However very few spiders in England can puncture human skin. The web is spun from glands at the tail of the abdomen. All spiders are capable of spinning webs, even the ones that don’t use webs to catch their prey. Spiders are very clean and spend hours grooming and cleaning themselves. 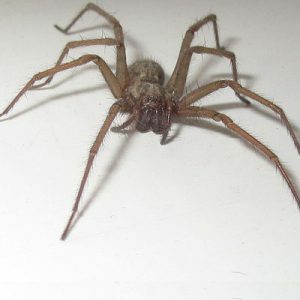 Old wives tales for dealing with spiders that are found through searches online suggest putting conkers in corners of a room, the use of peppermint oil or spraying a mix of vinegar and water around the house liberally. Unfortunately these methods are not effective and will not work. Clean your house and keep it at a certain level of tidiness, pay attention to skirting board and floor edges. Keep doors and windows closed to deny them access to your home and from finding a harbourage point. Prevent a build up of piles of clothes on the floor that can be enticing for a spider to hide in. Unfortunately even with all these methods, spiders can still gain entry to your home. We would recommend that anyone who doesn’t wish to interact with spiders may prefer to have a residual insecticide treatment conducted. The rooms that have the spiders in will be treated with one (or both ) of the following insecticide sprays: Effect Microtech CS’* which contains Permethrin, HSE Number 6287 and made by Sorex or K-Othrine WG250, HSE Number 5390 which contains deltamethrin 25%. These insecticides are the most modern insecticides available. The insecticide lasts for up to 3 months and the spiders absorb the insecticide as they walk over it and then die. PESTUK are full members of the BPCA, the governing body for pest control in the UK. Using a BPCA member company ensures you have a qualified and fully insured company treating your pest problem. Call us on 0330 100 2811 to book an appointment regarding how to prevent spiders or any other pest problem you may have.